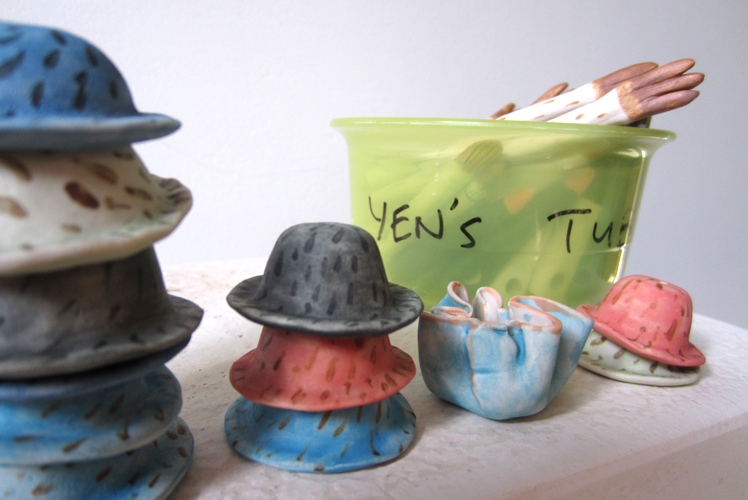 After a hiatus from her 20 year career as a Graphic Designer, Yen enrolled in her first ceramic workshop and became obsessed with everything it offered. It wasn’t long until her label Yen Yen Lo was born, and she hasn’t looked back. 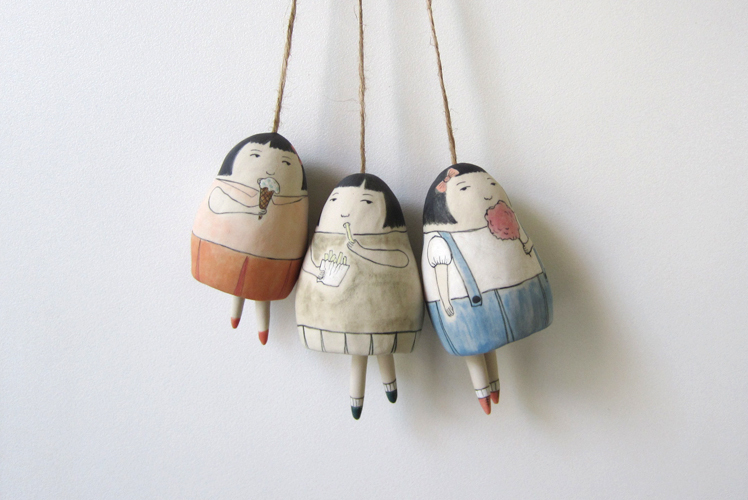 Read on to discover more about her whimsical process. 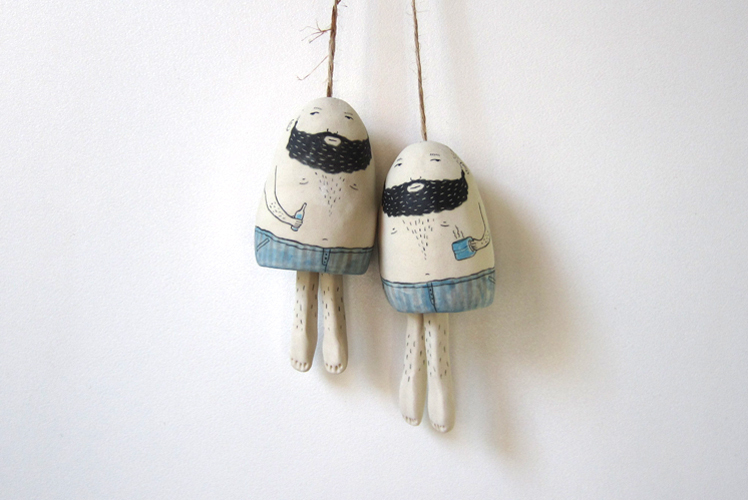 My work is a stylised form of illustration, which I incorporate into a shape that I’ve pinched out in clay. 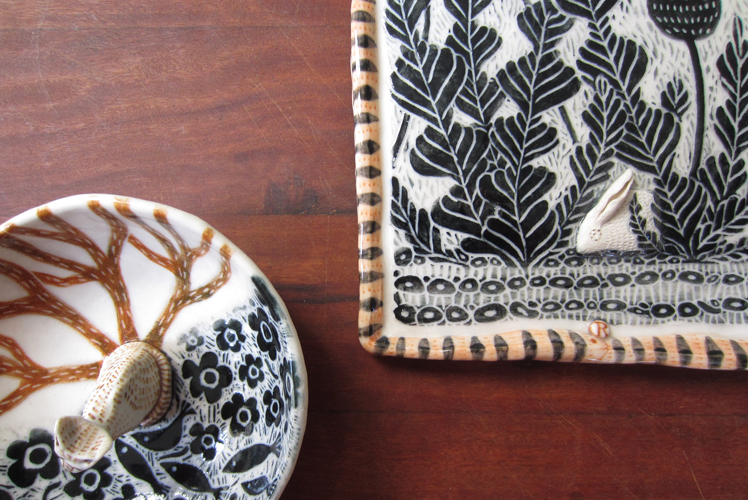 Sgraffito was the technique I used initially five years ago to create detailed decorative pieces of monochromatic landscapes (based on my vegetable garden), centred around a 3D rabbit and occasionally another animal on a plate. After some time, I wanted to explore another approach to decorating. Brushwork and a broader use of colour palette seemed the more effective tool to convey the whimsical nature of my bells. 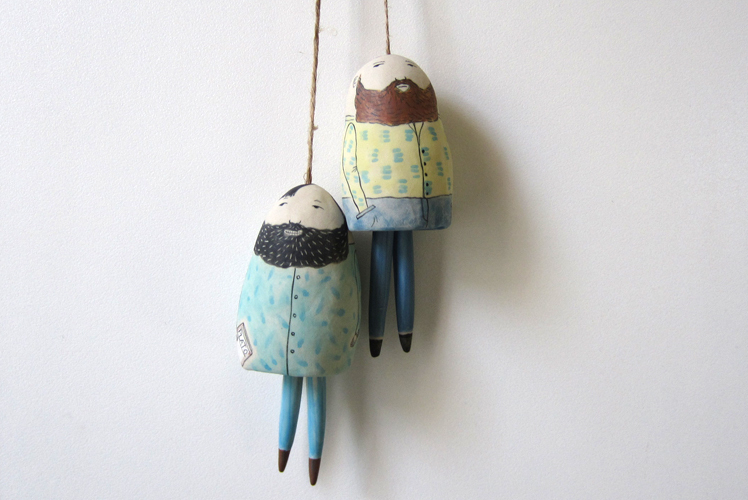 These grumpy-looking bell figurines with their little sidelong glances are in part inspired by the people I see on the trains and in my neighbourhood. I come from a graphic design background and had a career of 20 years in publishing, designing mainly books and magazines in both Singapore and Melbourne. In 2010, I took a hiatus from work and found myself very much in limbo. Quite by chance, I walked past the neighbourhood community centre and saw some children inside making a mess and having loads of fun at a workshop. So I asked if I could join in, and for the next seven weeks, I was the oldest and biggest kid in the pottery class. I felt rejuvenated, something I hadn’t felt for a long time. 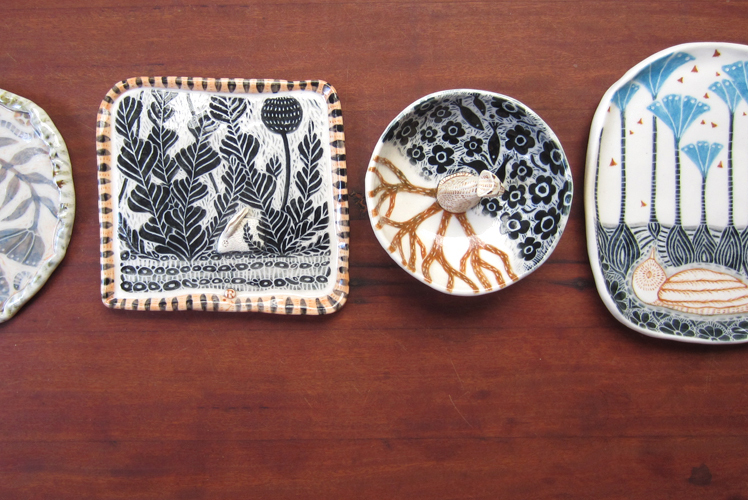 I’d been firing my pieces at Northcote Pottery Supplies for a while when SMALLpieces took a shine to them and asked if I’d like to retail some in their store. 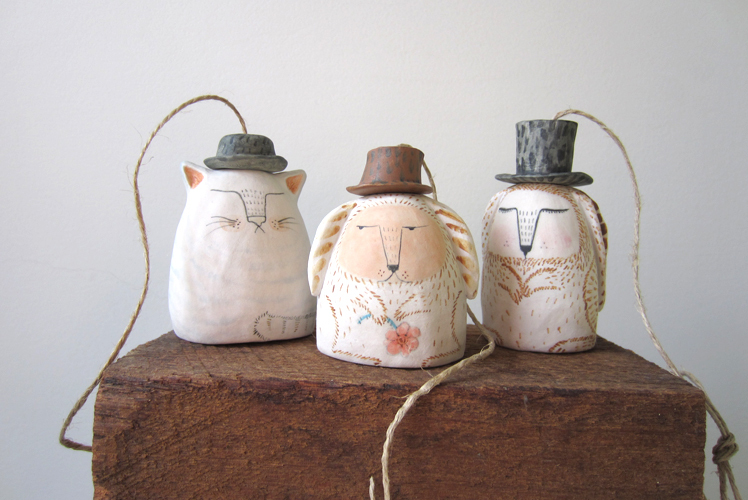 That marked my very first step into making and selling my work, followed by my foray into the makers markets a few years later. Who are your favourite artists? What inspires your work? The Brothers Quay, stop motion animators who directed the macabre but beautifully crafted short film Street of Crocodiles (based on a story by Bruno Schulz), using puppets, broken dolls and bits of rusty tools. Gillian Welch, singer and songwriter. Her music is great to work to, especially if I’m making something reflective. Her voice really sets the mood. My own sources of inspiration come from a list of rather disparate things that may trigger off an idea. It might be snippets of conversation with a neighbour, something I read or an outfit someone is wearing. At times, it is old photographs or stories my dad sends from home in Malaysia. Nostalgia and reminiscences play an essential part in my work. I love walks along the river and watching the birds. It is meditative and gives me a chance to spend time in my own head. Good ideas often spring from daydreaming. I have mainly used underglazes for decorating. It is very much like drawing on a blank canvas, and that’s a process with which I am familiar. But I also like to fuss over a shape and take my time adding details here and there. So, exploring and learning other forms of hand building – other than pinching – building bigger and more sculptural work and using different clay types are in the pipelines. Eventually, I would like to attempt making spindly-legged animals with long necks and ears, as they hold such fascination for me. My workspace is in the front room of my home which houses an eclectic mix of things I love, my tools, odds and ends picked up on my walks, paraphernalia from travels abroad and a wide collection of music. My creative process is a haphazard one to begin with. 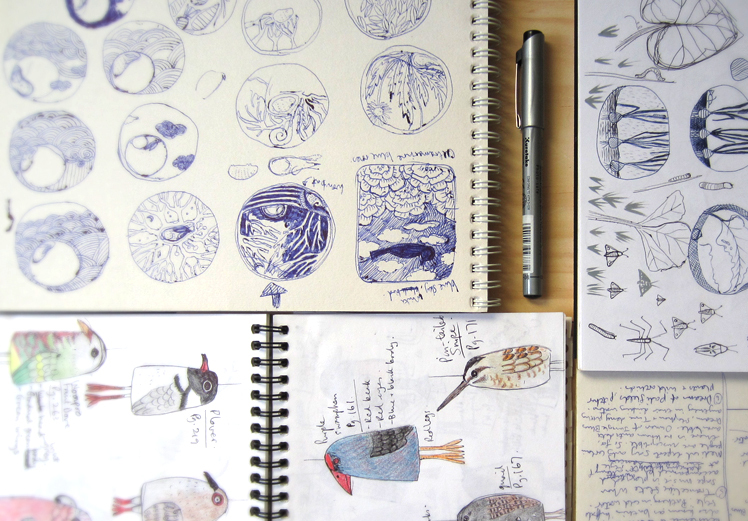 I am a sketchbook fanatic and have a few on the go at the same time. I tend to scribble down trivia gathered from something I’ve seen or heard. Usually I like to work with a theme and develop a series of thoughts based on that. I do some quick, rough sketches to determine if the idea is worth pursuing. If they hold any merit, I expand them into more detailed drawings and further refine them when I begin my actual painting or sgraffito. Persevere, be true to yourself and be imaginative.. This would be the project I’m working on at present. It’s for a client who is an avid bibliophile. I’ve always loved books and reading, so being commissioned for this project was like heaven-sent. I have been given free rein to do what I think best, which is the sort of creative work I really look forward to – no restrictions and plenty of trust on the client’s part. 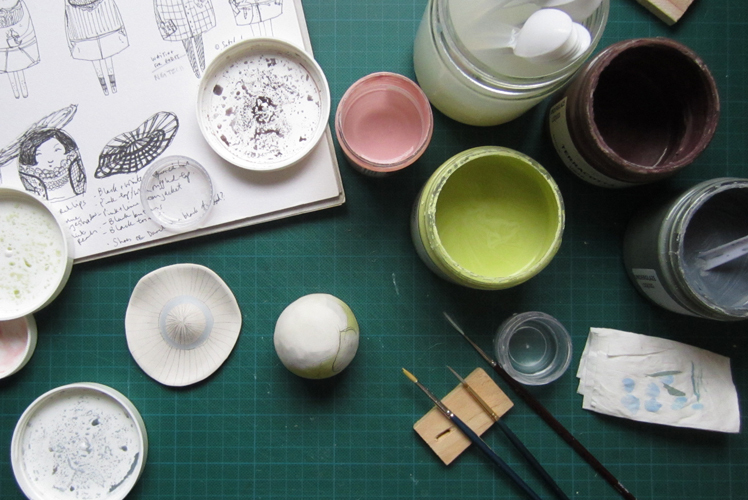 Without giving too much away, plans are in place to make a series of ceramic artworks with a literary theme. I am so excited and can’t wait to see how they’ll turn out. If you attended Camberwell Girls’ Grammar, then I bought a painting of yours. It is a leaf-sprite with a human hand. 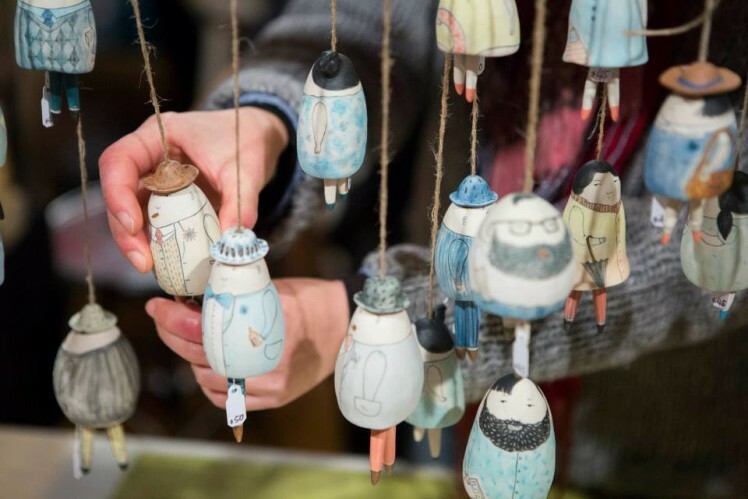 Could you create both children’s books and ceramics in ‘leaf-sprite’ characters? With extreme luck and work, it may even make little TV cartoon shows.